I love creating fun activities for my boys to participate in. If you have several little children at home and need to find a way to occupy them, then this busy bag activity is for you. If you’re ready to introduce your kids to some fun, then dive in! This busy bag might require some thought beforehand. What I mean by that is you need a container for the “Pom Pom Sorting” Busy Bag. You can really use anything you want. You can use an old container; you can buy a container, or just use your imagination to put a container together. I think a sour cream container or something that size works best. Our containers are actually some sturdy take n toss snack containers. You want the container to be as sturdy as possible. Have you ever seen these cute little pom poms at the store? I’ve always seen them but never really thought of a great idea for them. That’s when I got pretty excited about this pom pom activity. These doodads are pretty cheap at the dollar store. They will have several colors, so it’s great for the little guys and their concentration. This is probably the simplest busy bag you will ever put together. But just because it’s simple, it doesn’t mean you can’t do several different activities with it. The main objective of this activity is to put the pom poms through the hole in the container. This is great for motor skills in any age group. However, I’ve thought of a few other things you can have your child do to get even more learning out of this busy bag. – Have the little one separate the pom poms into colors and then put them into the container. – Counting the pom poms is also a great activity. This may take some work, but so does learning to count so it is the perfect combination. – If you have a few kids using this pom pom busy bag, you can simply have a fun competition. See who can get the pom poms into the bowl the fastest. – Of course you have the ever popular sort the colors into a muffin tin activity as well once you have the pom poms. This activity is useful for sorting colors, counting and following a pattern. As I said, this is a cheap, fun, and very easy way to entertain and educate your kids. Make sure you check out the other busy bag activities I’m posting. These activities are not only perfect for home but also perfect for taking out into public so the kids stay occupied. Have you made a Pom Pom busy bag activity? What types of activities do you do with Pom Poms? Find more busy bag activities to keep your little ones happy. This would be a fun activity. We have tons of pom poms for all our crafts. Thanks for the idea. 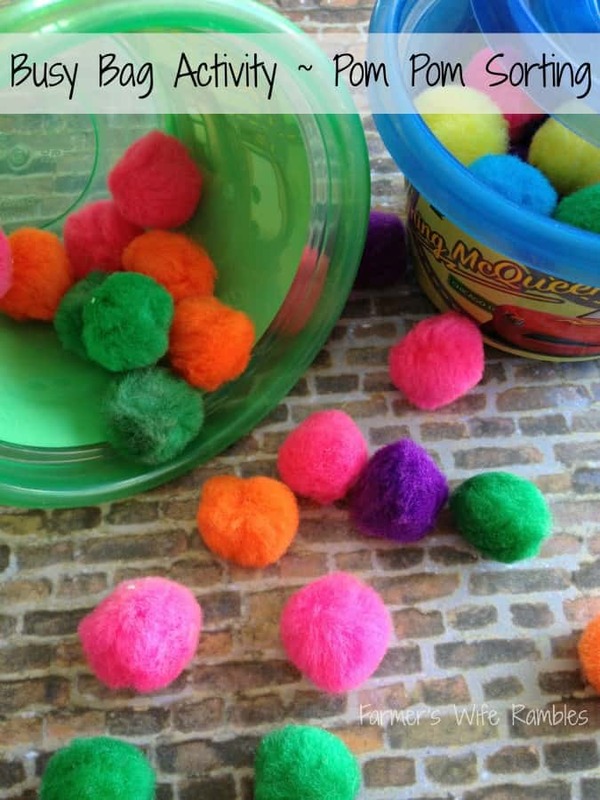 I have never made a pom pom activity and this idea with the container should be great with all different kids.